I was bad. I mean, I was very bad. 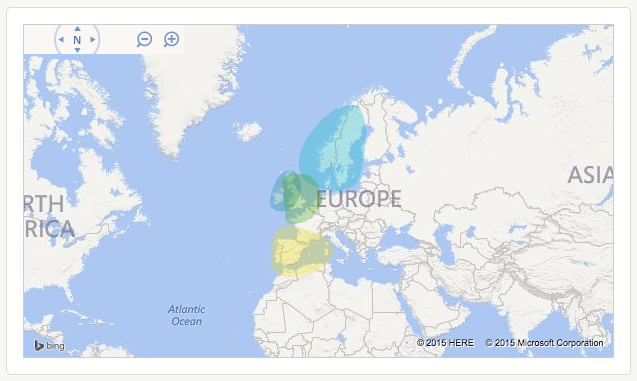 I got my wife an Ancestry autosomal DNA test for her birthday. Sure, she received some other gifts from me, but she thinks the autosomal DNA test was more for me than for her. She’s probably right – actually, she’s always right. I like figuring out relationships of DNA matches. For me it is great sport and she knows me well. So, I guess it really was my gift to me on the occasion of the celebration of her birth. After the test was done and the results were received, I started looking at her results. Ireland, Scandinavia, Great Britain – no surprises there. Iberian Peninsula is a bit odd, but not unbelievable. Then it hit me – No Swiss!? That is very odd. Two of her great grandparents emigrated from Switzerland. Her great-grandfather, John Huber, came from Windlach, Zürich, Switzerland. Family oral history says that his family farmed the same land for 800 years. Her great-grandmother, Bertha Trümpi, came from Ennenda, Glarus, Switzerland. With both great-grandparents coming from Switzerland, I would have expected her grandmother to have been 100% Swiss. With her grandmother being 100%, I expected my wife to be about 25% Swiss. However, there was no reference to that ancestry in Ancestor.Com’s ethnicity profile for her. That is really odd. 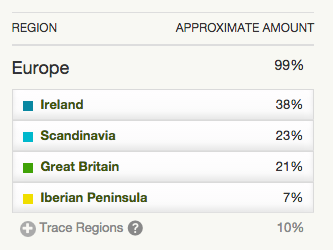 Now, the “trace regions” make up 10% of her DNA, but diving into that showed that she about 9% Italian, Greek, and “Europe West.” Anyway, 9% is a far cry away from the 25% that I expected. I’ll have to see if I can get her mother to test as well and see what comes through from those results. Although the Ethnicity Estimates are fun, the real reason for DNA testing is to make connections with others researching the same family trees and to facilitate communications between cousins researching the same family. For that, I was disappointed that Ancestry allows you to connect your DNA profile only to one tree. Long ago, I separated my wife’s family trees into two different trees – one for her paternal line and one for her maternal line. The biggest reason I did that was that other people, who are researching one line, are never researching the other line. I’ve also found that few people really care about the genealogy of individuals related only by the marriage of a distant cousin. Anyway, I think Ancestry should allow you to link an individual’s DNA to any tree that they are a part of. Anyway, because Ancestry.com doesn’t allow for multiple trees to be linked to an individual DNA profile, I needed to create a new tree just for her autosomal DNA results. So, I exported her two trees, then merged them into one, uploaded that as a new tree, and then linked her DNA to that tree. Sigh… Not a huge task, but now I have an instance of her tree that I probably will not manage. I looked closer at the DNA Matches. Wow, 180 matches at 4th cousin or closer. That’s amazing. One of the matches shared a common ancestor hint. A new 4th cousin’s relationship appeared. Ancestry showed my wife’s tree going up to the common ancestor and back down to the cousin. Then I looked at the cousin’s tree closer. She had parents for that common ancestor, names that I didn’t have. So, I now have two new ancestors named. The great thing is that individual also had sources for those ancestors. I can then take what she has and determine if I can follow her analysis and see if I agree. So, it is a great beginning to another research project. The other matches (3rd cousin or closer) either have private trees or do not have meaningful trees on Ancestry matched to their DNA. I will need to contact each individual and see if they have a tree elsewhere they will share with me. In any event, there are many new leads to follow because of the autosomal DNA testing of my wife. Have my wife’s mother tested though Ancestry. Follow-up research with Catherine A.D. Walter (wife’s shared common ancestor). identify and research any new ancestor leads. Next Next post: Relinking Family Tree Maker 3 — David Swayze in 1820 Census.